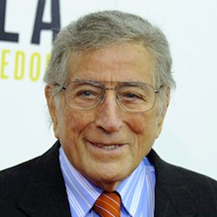 Anthony Dominick "Tony" Benedetto, stage name Tony Bennett, is an American singer of traditional pop standards, show tunes, and jazz. Bennett is also an accomplished painter having created works on permanent public display in several institutions. Bennett has won multiple Grammy Awards and Emmy Awards. He fought in the final stages of World War II as an infantryman with the U.S. Army. He is also the founder of the Frank Sinatra School of the Arts.